Largehearted Boy: Book Notes - Greg Vandy "26 Songs in 30 Days: Woody Guthrie's Columbia River Songs and the Planned Promised Land in the Pacific Northwest"
Book Notes - Greg Vandy "26 Songs in 30 Days: Woody Guthrie's Columbia River Songs and the Planned Promised Land in the Pacific Northwest"
Greg Vandy's 26 Songs in 30 Days examines the period in 1941 when Woody Guthrie spent a month writing a song a day about hydroelectric power, irrigation, and the Grand Coulee Dam for the Bonneville Power Administration, and is a fascinating glimpse of the musician's life as well as the social politics of the time. 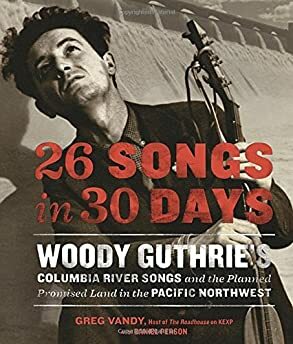 "26 Songs in 30 Days is a valuable addition to the Woody Guthrie library, not to mention a great read. Greg Vandy's love of the topic reveals itself on every page. The story he tells provides insight and clarity about a period in the life of Guthrie that hasn’t gotten its due—until now." I host a radio show on KEXP-FM Seattle, so making playlists is a weekly routine for me. It's a creative outlet that I really enjoy. Producing a three-hour radio program not only keeps me current on new roots music, but ultimately it's about sharing with a dedicated audience, which is what it's all about to me. During the main crunch of writing 26 Songs In 30 Days, I took a break from the radio show and retreated to a Methow Valley cabin (modern sense of the word, mind you) in the North Cascades to write. Since the book is primarily about Guthrie's month of songs for the Bonneville Power Administration in 1941, I really had to get a grip on these 26 songs - and that proved to be a challenge. Because Woody only recorded a fraction of the over 3,000 songs he wrote in his lifetime, and when he did, he recorded several versions from different sessions with revised titles and changed lyrics, so tracking down the original Columbia River songs was a task. Not to mention that many of the 26 songs were demos only to be discovered in the 1980's. In short, I really got to know these songs. It's gratifying to tell the story of Woody's Portland song cycle, which produced some of his best work and most famous songs. Not much has been written about them before (as a group), and quite the backstory was discovered. My writing partner (Dan Person) and I soon realized that these Columbia River songs were direct responses and optimistic answers to Guthrie's earlier and more familiar Dust Bowl Ballads, something which has never been claimed before. And that Woody was eager to spread the word and promote the massive Columbia River projects, it's resulting public power, and "the misty crystal glitter of that wild and wind ward spray". These are some of my favorite versions of Woody's original Columbia River songs. Woody Guthrie - "Roll on, Columbia"
One of the most well-known Columbia River songs, and the official folk song of Washington State, it was ironically thought to never have been recorded by Woody himself until 1987. It wasn't until then, and after the song was very well known, that a major discovery was unearthed by BPA employee Bill Murlin who discovered 10 long lost acetate recordings by Guthrie for the 1941 documentary film "The Columbia" at the agency's Portland, Oregon headquarters. This is the very original version of "Roll On, Columbia" by Woody himself. Imagine the excitement of Guthrie heads when this recording was discovered. Woody Guthrie - "Oregon Trail"
One of my favorite Columbia River songs written in Portland during Guthrie's employment with the BPA but not recorded until 1947 by Moe Asch for Folkways records. The Pacific Northwest had long represented the land of promise to early Americans and this song updates the notion of an Oregon Trail to a new prosperity. It was an optimistic response to Guthrie's earlier Dust Bowl ballads and reinforces his belief in a brighter future without "bony" horses whose ribs "you can count" and "cacklin' chickens that lay flint rock eggs," that beset victims of the Dust Bowl during the 1930's. Ramblin' Jack Elliott - "Talkin' Columbia"
I still have this as my voicemail greeting. The intro of Jack impersonating Woody, "I wrote 26 songs in 30 days! Only gonna sing about 24 of them tonight…. ", is both hilarious and a confirmation of the actual number of songs Woody wrote for the BPA, which at times has been a source of mystery. One of Guthrie's most frequently recorded songs, extolling the benefits of the dam projects while refuting criticism from eastern politicians, who "didn't know them raw Chinooks" (salmon) and suggested that the project was a white elephant. Lonnie Donegan - "Grand Coulee Dam"
Bob Dylan - "I Ain't Got No Home (live)"
When Dylan returned to public life in 1968 after recovering from a motorcycle accident, his first performance was Guthrie's Memorial Concert at Carnegie Hall in New York City. He performed "Grand Coulee Dam" and this song, with The Band. It's not a Columbia River song, but one of Guthrie's earlier songs about the migrant life of his people- the Dust Bowlers. Odetta - "Pastures Of Plenty"
This Columbia River song is one of Guthrie's most celebrated, and one of the greatest folk songs ever written. A ballad primarily about migrant workers, this song plays into the "Planned Promised Land" rhetoric used by the federal government as a solution to the Dust Bowl crisis of the 1930's. In effect, by turning previously unusable land in the Columbia Basin into an agricultural breadbasket by diverting Columbia River waters into the area via the Grand Coulee dam, was the "pasture of plenty" Guthrie anticipated. Odetta's 1960's version adds a considerable amount of heaviness to the song. Country Joe McDonald – "Tom Joad"
Country Joe was a big Woody fan and recorded a tribute in 1968, called Thinking Of Woody Guthrie, which in my mind is one of the best albums of Woody's music, mainly because it was recorded in Nashville with some of the best players of the time. It brings a full sound, incredible instrumentation, and tempo to Woody's songs, including this one, which is one of Guthrie's best Dust Bowl ballads about the main character of Steinbeck's iconic Grapes Of Wrath. Considered a Columbia River song although it has no mention of dams, irrigation, or electricity, Woody clearly used this previously written song to meet his song-a-day requirement set forth by his BPA supervisor, Stephen Kahn. One of the most recorded songs in Guthrie's catalogue, it was a favorite during the folk revival of the early '60s and became a phrase in the folk lexicon to separate folksingers who had lived it, like Woody, and the new urban folksingers who hadn't. Cisco Houston was a great friend and traveling companion of Guthrie during the 1940's. Pete Seeger is the primary reason Woody Guthrie became the legend and mythic figure we know today. Seeger's relentless passion and dedication to his old friend and musical partner (he first met Guthrie as a 19 year-old intern for Alan Lomax at the Library Of Congress in 1940) never wavered long after Woody wasn't able to represent himself in the 1950's and 60's due to his battle with the neurological condition called Huntington's disease. In this version of the song (back when it was thought that Woody never recorded it) Seeger explains how Woody became a "research assistant" for the BPA, which is kinda true. But the story goes much deeper as we explain in the book. This one is totally unrelated, but I include it because not only is Sam Doores a huge Woody fan (and "knows all of his songs"!) but I often refer to him as a modern-day Ramblin' Jack Elliott. He just has that thing, in character and style. And he writes great songs with his band mate Riley Downing of The Deslondes who get frequent spins on my radio show. The Deslondes (named after the street they live on in New Orleans) are example of how new troubadours walk among us, tracing a direct line to our musical lineage and glories of our past.